Since its introduction in 2011, MetaMoJi’s mazec quickly became one of the world’s leading handwriting engines, providing intuitive UI and market-leading recognition accuracy with its advanced prediction technology. MetaMoJi, a leading global provider of mobile productivity applications, announced today that it will ship its popular mazec keyboard for Apple’s iOS8. Apple announced this week at its Worldwide Developers Conference in San Francisco (WWDC 2014) that its new iOS8 update will give system-wide support for third party keyboards and keyboard applications. MetaMoJi’s mazec is a state-of-the-art handwriting recognition engine that allows smart phone, tablet and computer users to convert handwriting into text. MetaMoJi’s mazec already provides state-of-the-art handwriting recognition for virtually all major mobile platforms including iPad, iPhone, Android , Kindle Fire and Windows 8/RT devices. MetaMoji, Japan’s leading designer and producer of digital productivity applications, introduced mazec to the global market in the Summer of 2011 and saw immediate user interest in using its handwriting recognition engine on other iPhone and iPad applications. However, given Apple’s then operating system restrictions, MetaMoJi was unable to separately deliver the full mazec capabilities to the many Apple users of MetaMoJi’s popular 7notes, Note Anytime, and Share Anytime productivity applications. MetaMoJi’s new mazec keyboard will be an alternative to Apple iOS keyboards. 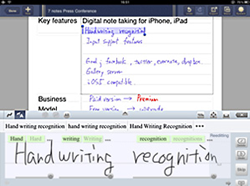 The unique mazec handwriting recognition engine works with all major iOS applications, including e-mail, web browsers, note applications, calendars, education, and games. The mazec keyboard will work only with iOS8 and will not be available iOS7 or earlier Apple operating systems.